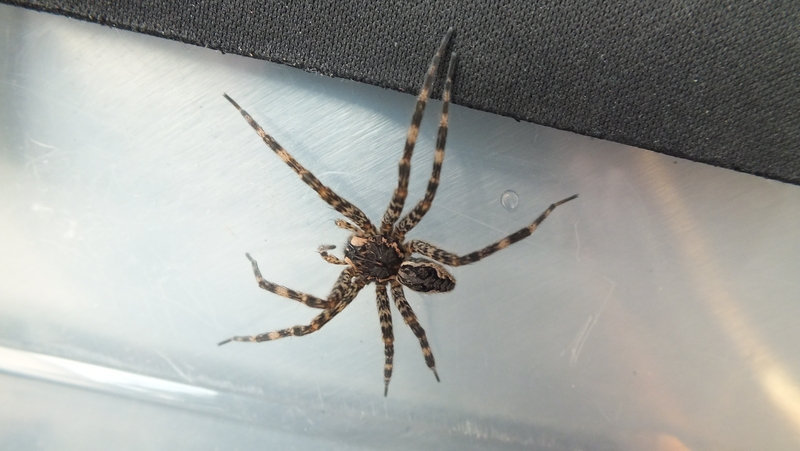 I found Canada’s largest spider… in my garage! She is a “Dolomedes” dock spider, aka fishing spider. Until someone inevitably corrects me in the comments, I’m going with “she” because the females are larger than the males, and this girl was big. Her body was almost 2cm long and her reach, a solid 5 cm. I found her while I was cleaning the garage. I moved a box and she scooted out from underneath and ran up the side. I was astonished how large she was! While I know there are no venomous spiders native to Ontario, and I know that spiders don’t bite people, I was still a bit unnerved. I think the uneasy feeling I get with large insects and spiders has to do with their speed. It’s the same thing when I’m trying to trap the large wood cockroaches that sometimes get into our house. I feel like they’re going to run at me, up my arm or leg or something. Then I ran for a glass to trap her under and my real camera so I could take her official portrait. (Nothing leaves this house without an official portrait.) I hoped she wouldn’t disappear among the garage boxes while I was gone. Interestingly, Chris says fishing spiders sometimes winter over in people’s basements and then make their way back to water in the spring. So I wonder if mine had spent the winter in or under a box and was just looking for a way out of the building. In fact, now that I think about it, just last weekend we brought several of those boxes up from our storage shed which is located right near a small wetlands area. She probably came from there. I uploaded full-size images, so click to enlarge. She really has beautiful markings. Her “hydrophobic” fine hair allows her to hunt from the surface of the water or “climb” beneath the surface. When under water, air bubbles trapped in her hair give her a metallic silver sheen. The short “front legs” are not really legs. They are called “pedipalps” and in spiders, function as taste and smell organs. Male spiders also use their pedipalps to transfer sperm to the female during mating. If you zoom in on this photo, you can see several of her eight eyes. Having that many doesn’t really help her see much better. She relies more on vibration in the water to hunt. Nice post on spider eyes here. Free at last. You can see how her stripes really work as camouflage here. Quite the spider, Kim. We’ve had several of this size under our docks on the Drag River. Or maybe it is just one spider with a long lifespan of several years. They can be unnerving but I appreciated your photos because ours move so fast, I can never get them to pose for photos.